Four years after the BBC brought us "the first truly digital Olympics", the emphasis on providing extra coverage of the events has moved online. So how can you get the most of this fortnight's sporting action on your TV? Compared to the last Olympics, Sky viewers have the biggest reduction in Olympic coverage available to them. Whereas London 2012, brought 24 extra streams of coverage, available in both standard and high definition, there's just eight extra streams available directly though your Sky box. You'll find the expanded service from channel 472 upward (not in the Republic of Ireland). The full 24 stream service this time is being delivered via the internet and isn't available via Sky - unlike other platforms Sky boxes don't support the increasing number of smart TV apps now ubiquitous elsewhere. So what are the alternatives? If you watch Sky on a smart TV, particularly one manufactured in the last couple of years, and that supports the current versions of the BBC's connected TV apps, you should be able to access the full Olympic service via the BBC Sport App or iPlayer App. Alternatively, the full Olympic service is available via smart boxes or sticks, such as Amazon Fire TV, Apple TV, the Now TV Box or Roku, to name a few. Look for iPlayer support when purchasing any new device. SD only - if you can't receive anything on channels 101-106, you're a SD user, and only have two part-time extra Olympic streams on channels 600 and 601. The full Olympic service is available via smart boxes or sticks, such as Amazon Fire TV, Apple TV, the Now TV Box or Roku, to name a few. Look for iPlayer/BBC Sport App support when purchasing any new device. Please see the "Notes" below for minimum broadband requirements. HD - some channels - if you get BBC One HD on channel 101, but not BBC News HD on channel 107, you'll get some extra coverage. BBC Four HD is temporarily available to you on channel 106 if you retune. If you have a Freeview Play device or a smart TV, particularly one manufactured in the last couple of years, and that supports the current versions of the BBC's connected TV apps, you should be able to access the full Olympic service via BBC Red Button+, the BBC Sport App or iPlayer App. This is available in HD, subject to your broadband speed/network quality. The resolution will adjust according to the quality of your connection. BBC Red Button+ is launched by pressing red on BBC channels - you may see a prompt such as Red Button+ • in the corner. You'll circumvent the original Red Button service found on channel 600 upwards, and be taken to the full 24 stream service via the internet. Alternatively, the full 24 stream Olympic service is available via smart boxes or sticks that you can plug into your TV, such as Amazon Fire TV, Apple TV, the Now TV Box or Roku, to name a few. Look for iPlayer/BBC Sport App support when purchasing any new device. HD - all channels - If you've been able to get BBC News HD on channel 107 and the QVC HD channels on 111/112, you should have retuned recently. BBC Red Button 2-7 (channels 602-607) in standard definition, BBC Red Button 1 24/7 (24 hour version of channel 601 in standard definition on channel 608) and part-time service BBC Olympics HD (channel 114) should now be available. If you have a Freeview Play device or a smart TV, particularly one manufactured in the last couple of years, and that supports the current versions of the BBC's connected TV apps, you should be able to access the full 24 Olympic service via BBC Red Button+, the BBC Sport App or iPlayer App. The 24 streams are available in HD, subject to your broadband speed/network quality. The resolution will adjust according to the quality of your connection. Get the full Olympic service with BBC Red Button+. Red Button+ is launched by pressing red on BBC channels - you may see a prompt such as Red Button+ • in the corner. You'll circumvent the original Red Button service found on channel 600 upwards, and instead be taken to the full 24 stream service via the internet. Older Freesat receivers can access extra Olympic streams from channel 261 upward. Use a smart box or stick such as Amazon Fire or Roku to add the full 24 stream service via the internet. Newer receivers, i.e. those originally sold under the Freesat Freetime sub-brand, can access Red Button+ following its low-key roll-out on boxes last year. Here, you can access the full 24 stream service via the internet. Red Button+ is launched by pressing red on BBC channels - you may see a prompt such as Red Button+ • in the corner. You'll be taken to the full 24 stream service via the internet, which is available in HD, subject to your broadband speed and network quality. 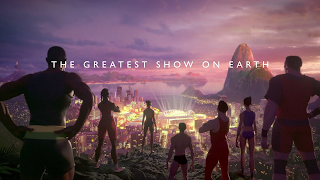 TiVo users can access the full 24 stream Olympic service via Red Button+, which is delivered via the internet, which is available in HD, subject to your broadband speed and network quality. Alternatively, 8 streams (in HD and SD) are available from channel 561 upwards. For the full 24 stream service, use a smart box or stick such as Amazon Fire or Roku plugged into your TV to add the full service via the internet. Remember that the BBC's online services require a broadband download speed of at least 2.5 Mbps. You'll often get the best experience if you're using a wired connection. And, you should ideally be on an unmetered internet connection (i.e. no monthly usage cap).